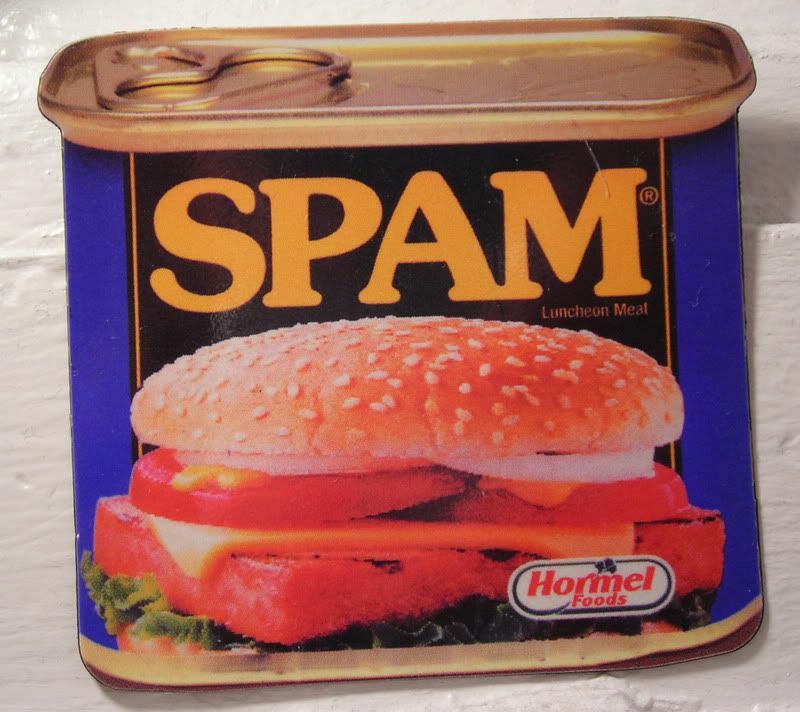 SPAM's become somewhat of a pop culture icon nowadays - most people know what it is, most people know what it tastes like, but most people refuse to admit that they've ever bought it. I'll go out on a limb by wagering that most Filipinos have had it for breakfast at some point in their life or another. Usually on a visit to some relatively unknown "auntie" or "uncle" - of course, you're not really related, they're generally some sort of a distant, distant cousin of your grandma's uncle, or some classmate your parents had in second grade, or knew med school. Of course, you've never met before, but you generally end up spending the evening hanging out with the kids of the family, playing with their toys, or running around outside, or watching every movie they own. After you've spent the night on blankets on the floor or on the sofa in the basement or in the guest room, you usually wake up to the sounds of all the mothers yakking it up in the kitchen, while the fathers are at the kitchen table with their coffee and bread. Somehow they're still gossiping about days and people gone by. But, it's the sounds and the smells you remember: always the sound of frying eggs - always. And every once in a while - the smell of frying SPAM. "Good morning, good morning! "s greet you, as you groggily drag your feet into the kitchen, and suddenly a plate full of fried eggs, SPAM and of course, rice, magically appears on the table in front of you. And, even though you may not have had it since, I'm telling you, the smell of SPAM in a frying pan can still make you feel like you're eight years old again, in some random house in some random state with some random aunties and uncles, randomly wondering how you got there in the first place. Spam spam spam spam. Lovely spam! Wonderful spam! I love Spam, and I don't care who knows it! My preference is turkey Spam. Make it into a SLT: a Spam, lettuce, and tomato sandwich. Or, chunk it and stirfry it with peppers and onions. Or, put it as a layer in grilled cheese. It's a dirty little secret, but I'm willing to share. Hah. Sooo, *not* a Filipino phenomena then. Actually, on a whim, I bought some a couple of weeks ago, and felt a little stigmatized when the cashier rang me up. I dunno why. Have you had the SPAM with cheese already in it? They don't sell it here in town. Actually, I don't think they sell anything but regular here. Heh. Somehow I bet I'd really enjoy the SPAM festival. Oi, very, very true! I forgot about corned beef hash. Or corned beef...sauteed with onions. Mmmmm!